We believe that every product needs a unique reason to exist: to serve a purpose or to solve a problem. And this reason should be discovered not constructed. Our design approach is one without preconceptions. It is iterative and direct. Rather than bringing a clear roadmap from the start, we experiment and adjust to where the product takes us. We perfect our designs through digital technology and old-fashioned craftsmanship like sculptors in our workshop. Our design process is based on what we call ‘direct design’. A very hands-on exercise that allows for lots of curious exploration and tactical experimentation as we move towards the final design. The design process is divided into three overall stages. An object should be instantly recognisable, even from a distance. And upon closer inspection display a meticulous attention to detail. Its purpose must be as clear as the benefits it offers. Our method to achieve these characteristics is much like that of a sculptor as we chisel away the excess until the essential idea reveals itself. 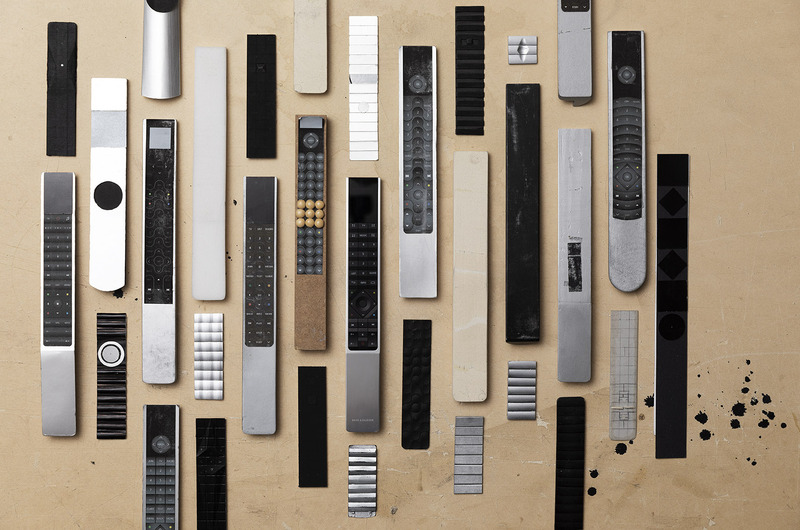 Appealing and relevant design isn’t created in a vacuum but shaped by different factors. We need to relate to the user we serve and to the world that he lives in. We have to understand our client’s objectives and aspirations as well as the technology that defines the experience. Great design; the kind that defies trends and fads comes from finding the true identity of an object. This true identity is both original and new; it’s intuitive and obvious. When setting out to create a new design, we use our 4 guiding principles to navigate from. The objective here is to gain a deeper understanding of the project and uncover potential design solutions. We don’t look for clues in surveys. Instead, we try to become the product user; to think like him, ask his questions without any preconceptions. When we are able to provide real answers, we know we are on to something. Pairing these insights with our client’s own expertise, we start sketching and soon the first ideas start to materialise. These are then shared and evaluated with the client. Based on the findings and decisions from the initial stage, our experiments continue. We sketch, build and refine models until the basic idea presents itself in a clear and attractive design concept. At this point we typically produce one or two tangible design suggestions. This provides our client with a clear picture of form, material choice and how the product performs. All things that must be cleared before we move on to the final stage. Designing a product that peaks in the store is the essence of everything we do. This can only be achieved in respectful and knowledge-driven partnership with our client as we strive to make the seemingly impossible come to life. At this stage, a feasibility study reveals issues such as technical challenges, production viability and manufacturing costs. With close support from us, the client proceeds to the initial product development stage. Any obstacles that arise we take as an opportunity for further improvement until the final product is reality. Appealing and relevant design isn’t created in a vacuum but shaped by a range of different factors. We need to relate to the user we serve and to the world that he lives in. We also have to understand our client’s objectives and aspirations as well as the technology that defines the experience. We want to create a yearlong love affair between user and product. This requires intimate familiarity with the problems we are solving and whom we are solving them for. We do this by physically playing out user experiences and asking all the difficult questions we need to answer. We combine these findings with those of our client to get the most accurate insights as possible. We firmly believe that the best products come from a close and constant collaboration between the client and us. We are not a ‘designer’s designer’ but aim to create concepts that transform into marketable products of great value to all. We need the best version to be the final one that reaches its users, and this is a shared responsibility. We are always looking for inspiration and to gain new knowledge and insight into the world around us. 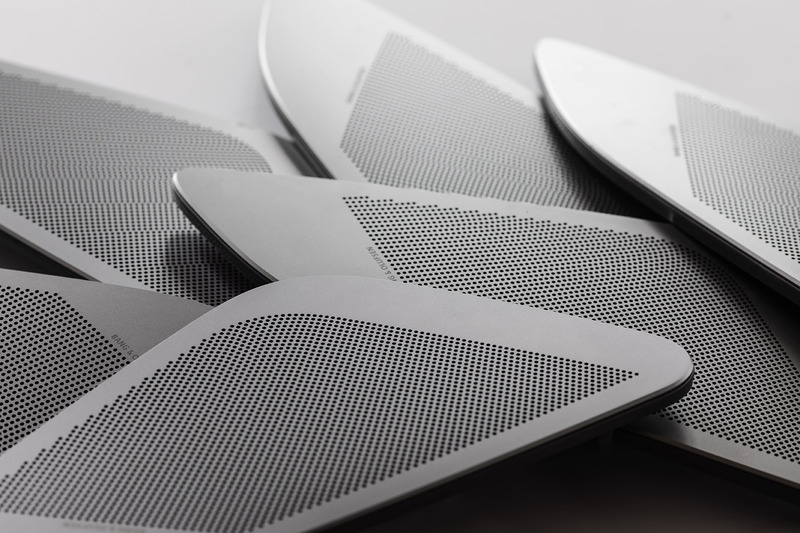 A high-end product, designed for a short-lived trend will have an equally brief life span. Therefore, we follow the constant evolution in society and technology to stay ahead of the curve when it comes to designing products that will remain attractive for years to come. Technology is a wonderful enabler that provides the user with access to a world of entertainment or helps to perform certain tasks better. As designers, a key objective is to find the ideal solution that makes the interaction between user and product as transparent as possible. At the same time we want to make every encounter memorable and enjoyable – magical even. 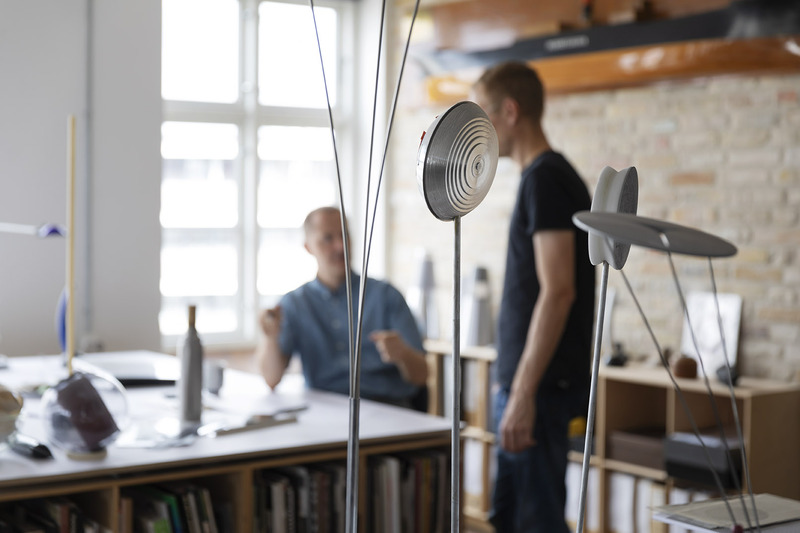 Pay us a visit at our studio in Copenhagen, and you will immediately notice that it looks a lot like a sculptor’s workshop with large sheets of cardboard, pieces of aluminium and unfinished models made from wood. The reason is our love for working with full-scale models, which we find to be the most direct way to read and understand an object. At the same time, their physical presence keeps your focus on the essential and serves as strong sources of inspiration. The first thing we do, is remove anything that takes away from the original idea. We keep going until there is only the essential left. Then we make sure that every shape relates to the idea and to the object’s unique reason to exist. Now the idea becomes the product identity. A shape must be strong, have attitude and evoke emotions because only then will you as a user connect with it and remember it. At the same time, it should still be unobtrusive and never demand too much of you nor its surroundings. 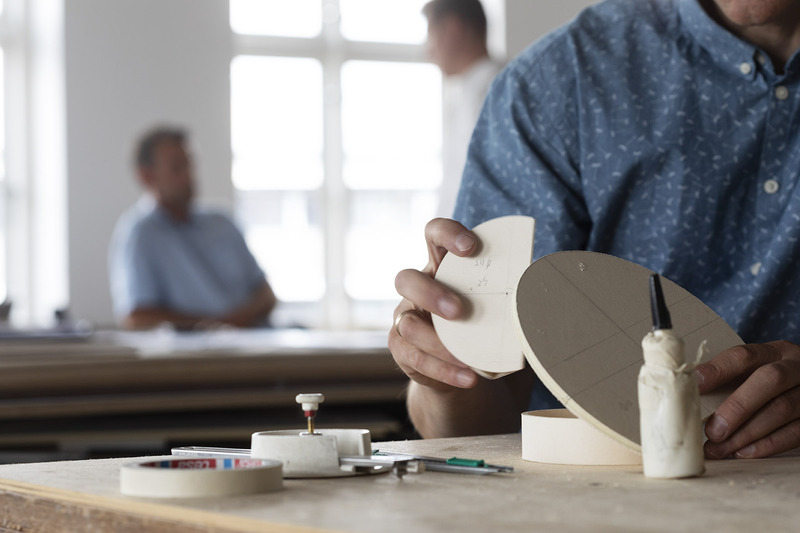 When we shape an object, we use our knowledge of production methods to steer clear of manufacturing challenges but without compromising the idea and our big dream. We collaborate productively with engineers and make sure to take any challenge as an opportunity to develop an even better product that peaks in the shop. To us, a high quality product looks complete from any angle you choose to look at it. In short, no element should appear like a compromise or an unsolved problem. We want to show the user that we went to great lengths to design the very best version of this product. In the end we all need to be proud of it. The object should be instantly understood by its user. Users interact with objects based on habit, experience and culture. Therefore, any successful product design must respect certain conventions regarding shape and form language, no matter how revolutionary it is. The object should stay desirable. A design that is both original and iconic stands a much better chance of keeping its appeal. Such an object has an inherent sculptural quality that draws attention for all the right reasons; because it is relevant, beautiful and made to last. The object should make you feel like it was made just for you. At first glance, the design should invite the user to take a closer look and interact with the object. This initial encounter should leave him convinced that the product was designed just for him as the interaction remains appealing, addictive even, and never becomes tedious. The object should feel like the perfect gift. We have all tried it from time to time. To come across a product that automatically draws you in. You just have to touch it and look closer. Every detail is just right. Giving these experiences should be the goal every single time. We create designs that we are proud of, and we believe the user will share this feeling.